Ariana Grande is gearing up for the release of her fourth album Sweetener, expected out on August 17. It’s her first full album in two years, following up 2016’s Dangerous Woman, and while we don’t yet have an official track list, Grande has been generous with hints and previews. Here’s everything we know about the new album so far. On May 22, 2017, a bomber detonated an explosive in the lobby of Manchester Arena in Manchester, England just after an Ariana Grande concert. Twenty-two people were killed and more than 500 were injured. 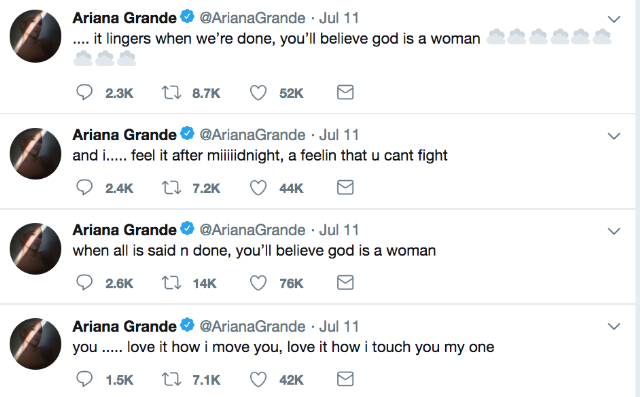 In response, Grande first canceled some European concerts, then changed her mind: According to manager Scooter Braun’s recent interview with Time, she decided, “If I don’t do something, these people died in vain.” Grande went on to organize the One Love Manchester benefit concert on June 4, 2017, performing alongside stars like Justin Bieber and Coldplay and raising millions in donations for victims and their families. The show culminated in a performance of My Everything single “One Last Time” and a powerful, stripped-back performance of “Somewhere Over the Rainbow.” Grande was subsequently named Manchester’s first honorary citizen. “No Tears Left to Cry” was produced by “Into You” collaborator and pop music deity Max Martin, who reportedly helms about half the album. Though “No Tears” had every reason to be a downtrodden ballad, Grande told Time she deliberately avoided gloominess: “I don’t want to give [the attack] that much power,” she said. “Something so negative. It’s the absolute worst of humanity.””No Tears Left to Cry” peaked at #3 on the Hot 100 and currently sits at #9 after two months, likely giving it staying power through the summer. The song also received a surreal and visually striking music video, directed by Dave Meyers (Kendrick Lamar, Maroon 5, Katy Perry). Ariana revealed that “God Is a Woman” is her grandmother’s favorite song on Jimmy Fallon. In Elle magazine, writer Katie Connor notes that, despite the song’s saintly title, it is “more about taking agency in the bedroom than at the office.” Connor also notes that the Vera Wang dress Grande wore to the Met Gala earlier this year, inspired by Michelangelo’s The Last Judgement, is meant to be “a hint, a foreshadow” of the “God Is A Woman” video. Pharrell is handling the production on several other songs, including eccentric Nicki Minaj-featuring single “The Light Is Coming,” which received a video also directed by Dave Meyers. Speaking with the Fader, Pharrell described his role as “part listener, part therapist, part stenographer.” “The Light Is Coming” features a sample from the late U.S. Senator Arlen Specter, whom Pharrell also sampled on last year’s “Lemon” with Rihanna. Grande previously collaborated with Minaj for 2016 hit “Side to Side,” and they teamed up again for recent song “Bed,” set to appear on Minaj’s upcoming album Queen. On June 26, Grande took to Instagram to preview “Raindrops” (below), which interpolates Frankie Valli and the Four Seasons’ “An Angel Cried.” She also previewed a new song called “R.E.M.” in a game with Elle. Grande’s whirlwind romance with her new fiancé, Saturday Night Live’s Pete Davidson, has snagged almost as many headlines as her album rollout—but Davidson is on the album too, in a sense. Sweetener features an interlude track titled “Pete,” a fact Grande recently revealed to fans on Instagram. She’s continued to play into fan interest in both her new music and her new relationship, including a cheeky tweet about the length of the track. Ariana Grande’s new album Sweetener is scheduled for release August 17 via Republic Records. This article has been updated with new information as of July 12.